Financial pressures will end World Book Night USA. 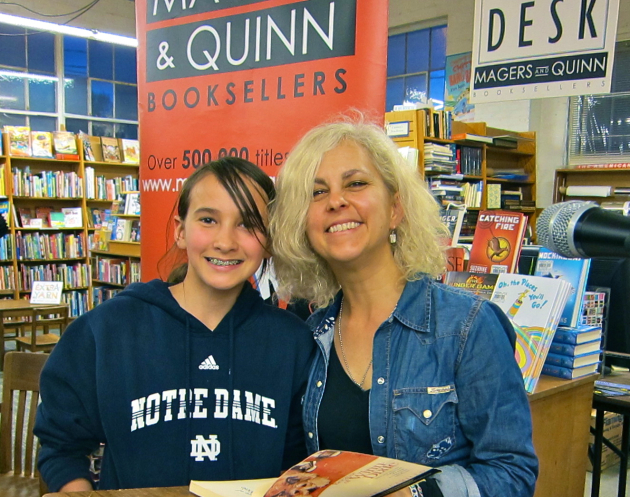 Kate DiCamillo signs books for fans at a 2012 Magers & Quinn World Book Night party. That year DiCamillo's "Because of Winn Dixie" was given away, as was Leif Enger's "Peace Like a River." Both writers attended the event. It will be sad to see World Book Night USA go. It was a crazy, ridiculous, beautiful scheme that sought to give away a million books every year on one specific day in April. The organizers quickly scaled back their goal to 500,000 books a year, but that's still a tremendous number, and over three years of giving they had a lot of success. Every April since 2012, volunteers all over the country gave away boxes and boxes of books to anyone who wanted them, no strings attached. "For three years, the publishing industry and book community have very generously footed the bill and contributed enormous time and effort, and we are so very grateful for all the support," the press release stated. "We did receive some funds via individual donations, and we worked very hard to get grants. We did get some, but there are a lot of other worthy causes out there and only so much money available. We can't carry on without significant, sustainable outside funding." Each year, World Book Night chose 30 titles for giveaway. Publishers absorbed the cost of printing special editions of the books, authors waived their royalties, and volunteers signed up to hand out the books--at community clubs, city parks, homeless shelters, nursing homes, taverns, schools and other public places. Bookstores and libraries served as book depots, housing the titles until giveaway night, and hosting parties for givers and authors. Titles by Minnesota writers Leif Enger, Kate DiCamillo, Garrison Keillor, Cheryl Strayed and Peter Geye were among those given away over the years.